Twitter did it in 2007. FourSquare did it in 2009. Highlight sort of did it at last year’s SXSW. 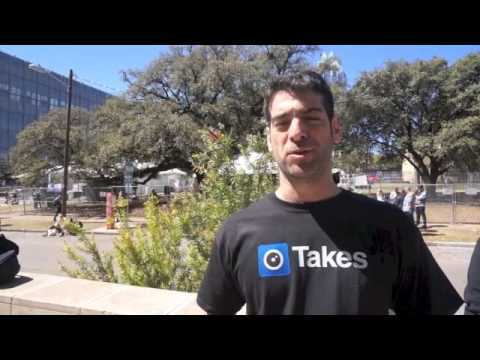 So, will any app break away from the pack at SXSW 2013 to become the “it” app of SXSW 2013 — the one that takes first the festival’s ultra-wired attendees, and later the world, by storm? USA Today and others are similarly impressed (Boston Globe: “This app has what it Takes,” Huffington Post: “ Takes is seriously mind-blowingly fantastic”). Takes promises to “transform your photos into amazing videos that you can share.” It’s a weird concept, compared to normal camera apps, because basically, what it is doing is filming a little video around each photo you take, so that it can include that in your shot too. This gives you an original, personal thing to share. Takes are made out of (only) photos you’ve shot within the app, and (only) the music you’ve chosen within the app. The second restriction is what makes Takes legal, from a music-sharing perspective. If you choose one of the pre-cleared songs (see some in the screenshot to the right), you can share your Take on Facebook or Twitter. If you choose to use music from your iPhone, you can only share via email. However, there is a loophole: You can save the video to your Camera Roll, and then you can pretty much do whatever you want with it, infringing or not, as you would with any other video. If, on the other hand, you want to use one of the pre-cleared songs that come with the app, you can’t preview it to find out what it sounds like. Wait — you’re supposed to share this “Take” potentially with everyone you know, and yet you can’t find out what the music is going to sound like? That’s no good. We like how easy it is to select the photos and put these things together. Takes simplifies the creation process nicely, so all you have to do is shoot a bunch of new pictures, select them (super easy due to the way the app sorts your Takes-compatible shots), choose the music, and share. Done. You made a thing. However, Takes’ music feature needs A) licensing that lets you use any song, or at least B) the ability to preview the music before posting. Isn’t anyone down in Austin using this?